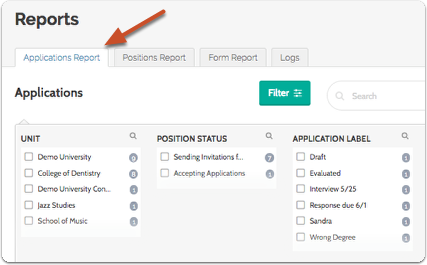 Applications Reports allow Administrators to pick and choose from an extensive list of applicant data fields to create a customized report, which can be viewed onscreen, saved and recalled, and downloaded as a CSV file. 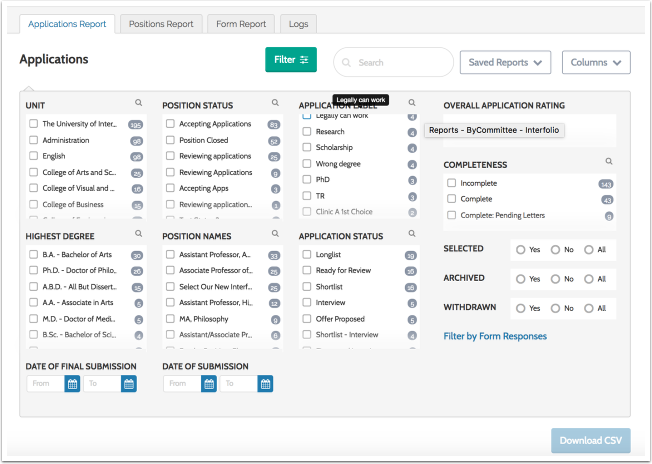 Applications Reports are created by applying a customizable set of filters to sort applications along many possible data points. ...the applications meeting the criteria are displayed. You can even customize what columns of information will display. 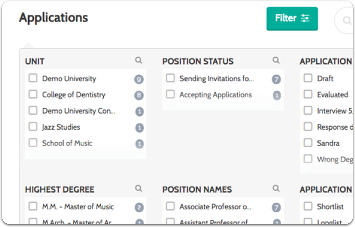 By default you can filter by unit, status, degree, tags, name, etc. 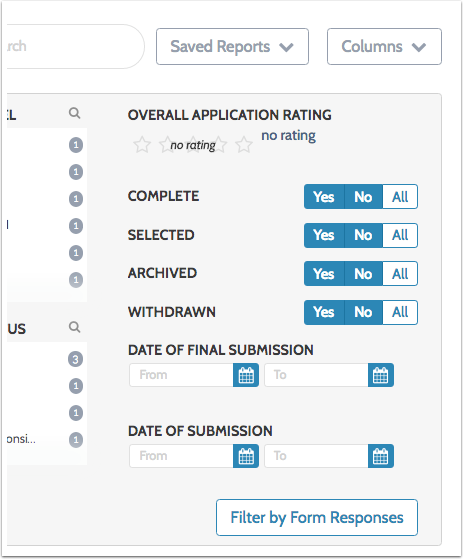 You can sort by application ratings, completeness, choose to view only selected or rejected applicants, and view archived or withdrawn applications. 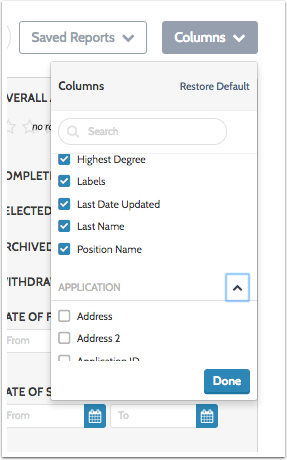 You can also filter by date of final submission, and date of first submission, and filter by responses to form questions. 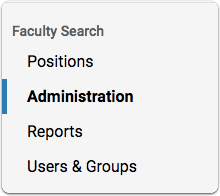 Click "Filter by Form Responses" and select the form, question, and response. 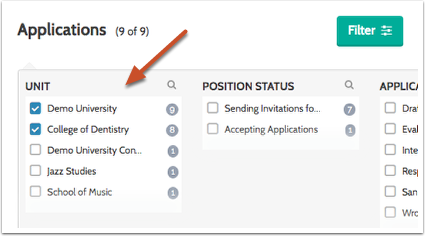 There is an extensive list of possible columns including information about applicants (telephone, email, city, state, ratings, etc.) information about positions (dates, committee members, salary range and so on). 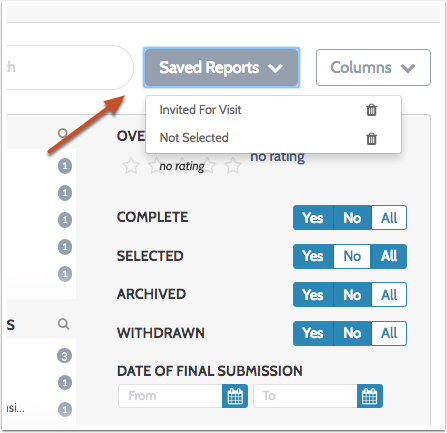 You can even add a column to see responses to one or more form questions. 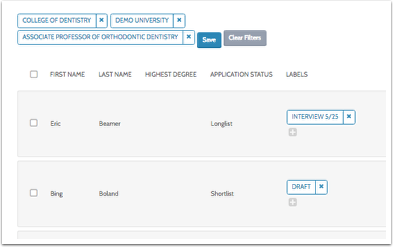 The list will display your custom columns and applied filters. Click "Download CSV" to save a spreadsheet file of the results. 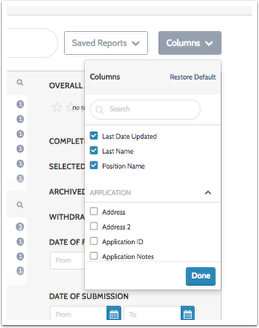 Save and name your report so you can recall this set of filters and columns later.